Ever since my first time attending the Total 24 Hours of Spa FIA GT race in 2008, I’ve been fascinated by the cars and culture of GT racing in Europe, and have been pining for an opportunity to shoot these European GT cars again. 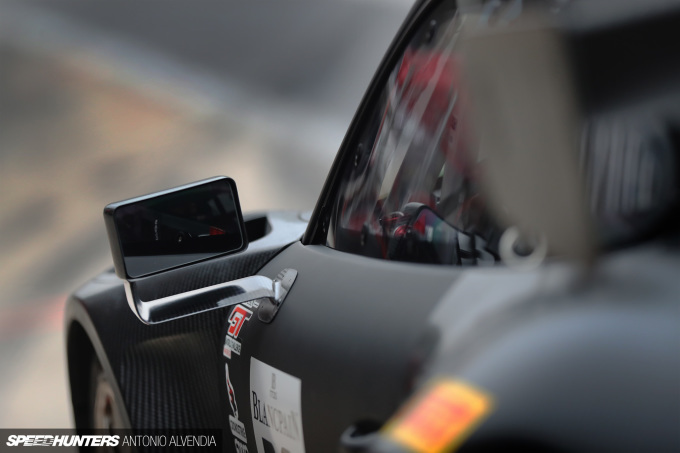 Fast forward to the end of 2014 – the FIA GT Series was renamed as the Blancpain GT Series after series organizer SRO Group partnered with famed Swiss watch manufacturer Blancpain, maker of the prestigious Fifty Fathoms watch (non-French speakers, the company name is pronounced as Blonk-pan, not Blank-payne) to offer teams and drivers the opportunity to compete for an overall Blancpain GT Series title, linking sprint and endurance racing. When SRO announced that it would be bringing the series to the United States in 2019 as the Blancpain GT World Challenge America with a season opener event at Circuit of the Americas (COTA), I immediately booked a flight to Austin, Texas. I couldn’t wait to shoot this series again. I’ve been wanting to shoot photos at COTA ever since it first opened, but didn’t have a chance to visit until only this year. The 3.4-mile Formula One racetrack looks amazing, with dramatic, natural elevation changes, including the incredibly steep 133-foot climb up to Turn 1. The 20-turn circuit incorporates some of the best-loved and most challenging turns from other iconic F1 courses, and the red, white, and blue paint surrounding the track makes for some spectacular photo backdrops and foregrounds. 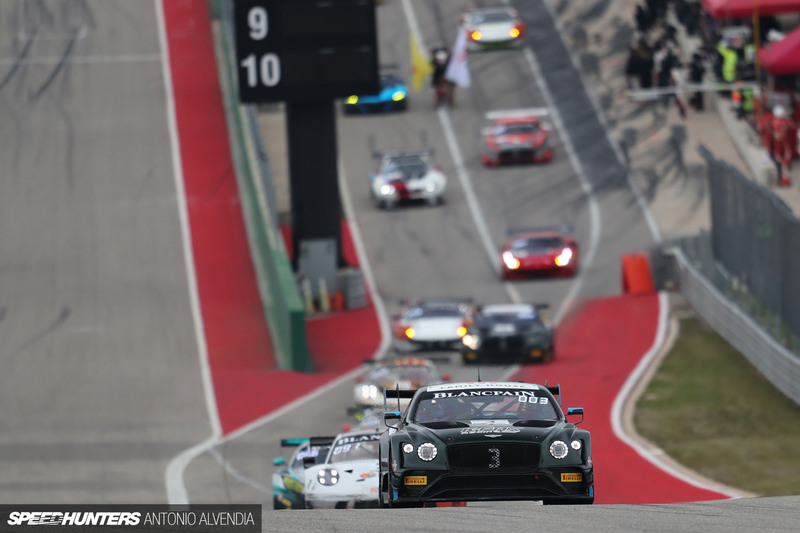 Aside from an amazing venue, the Blancpain GT World Challenge America also has incredible machinery competing for top spots on the podium. 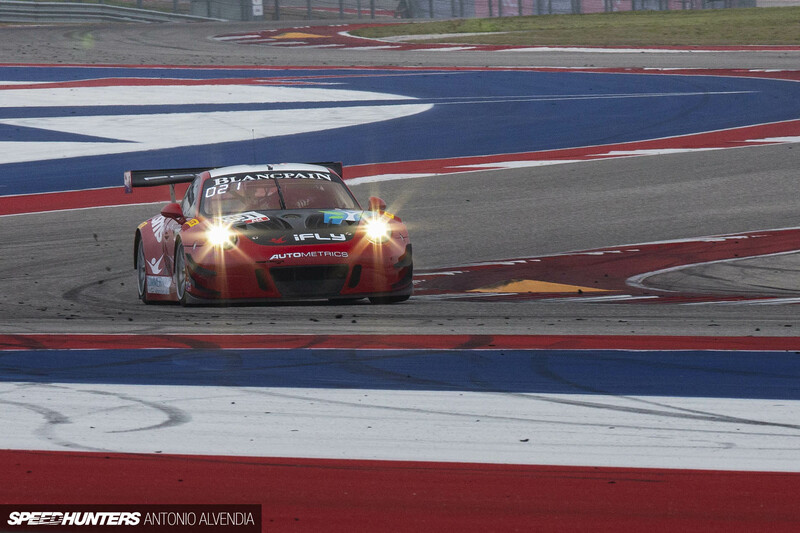 Since it was my first time to the Circuit of the Americas, I was honestly a bit nervous in shooting there. 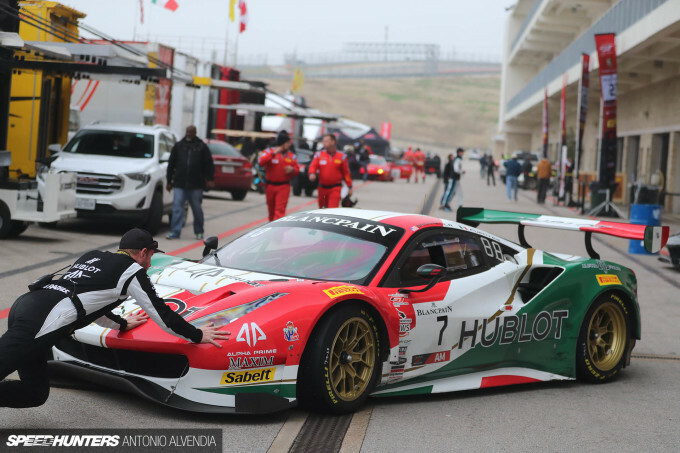 After all, there have already been lots of epic photos produced at COTA, and I felt like I had big shoes to fill. Kevan Millstein and Alex Barron, the drivers of this wide-body 991 Porsche 911 GT3R, admitted to me that they didn’t have time to wrap their car yet, but in my opinion, this 500hp NA beast looks amazing in all black, with its raw exposed carbon fiber body panels. Aside from the carbon fiber bumpers and fenders, check out the Lexan windows and F1-style aerodynamic carbon side mirrors on the doors. Super cool. One of my favorite liveries from the series would unquestionably be the the red, white, and green wrap on the Ferrari 488 GT3 being driven by Martin Fuentes from Mexico City and Caesar Bacarella, an Italian driver from the New York area. The colors on the car pay homage to the ethnic background of both drivers, and it always catches my eye on the track. 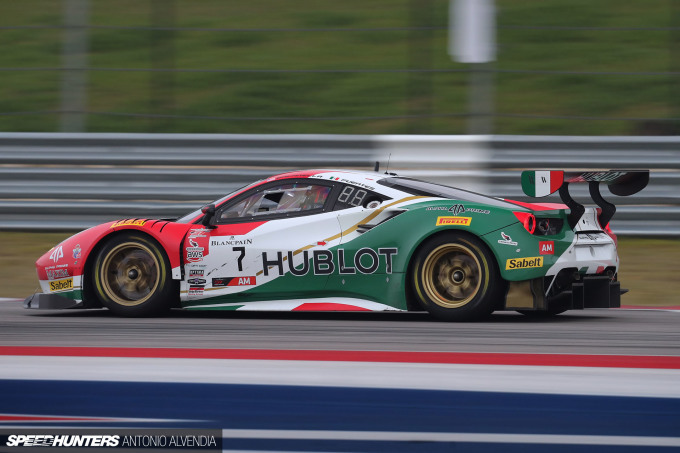 I wonder if anyone else finds it ironic that there are two large logos from high-end watch sponsors on the car? 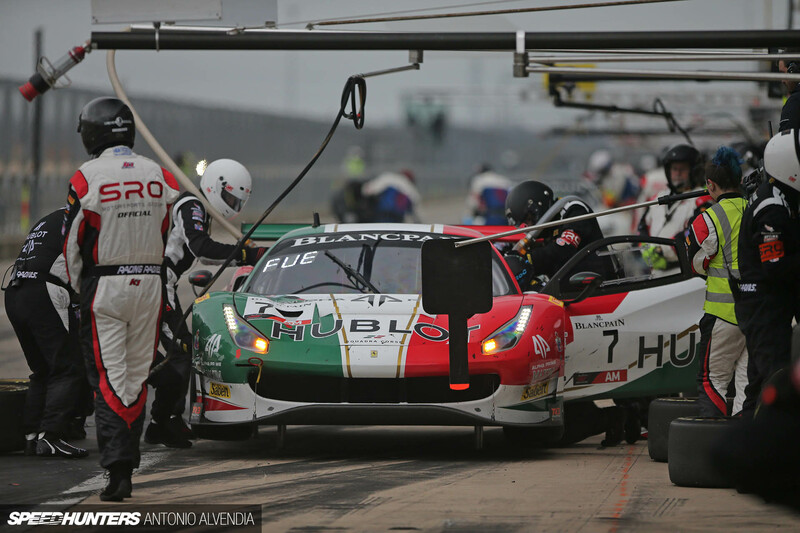 Hublot sponsors the team and Blancpain sponsors the series. 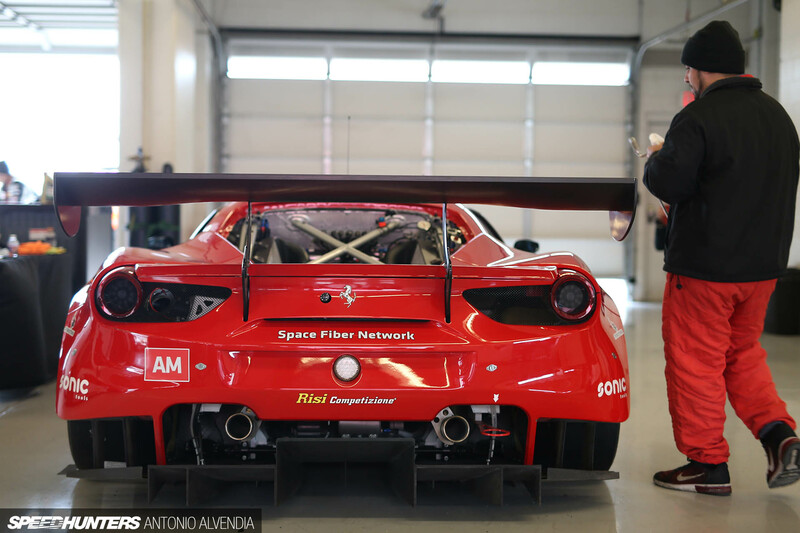 Either way, this 488 GT3 always looks great on the track, and both drivers are fast. 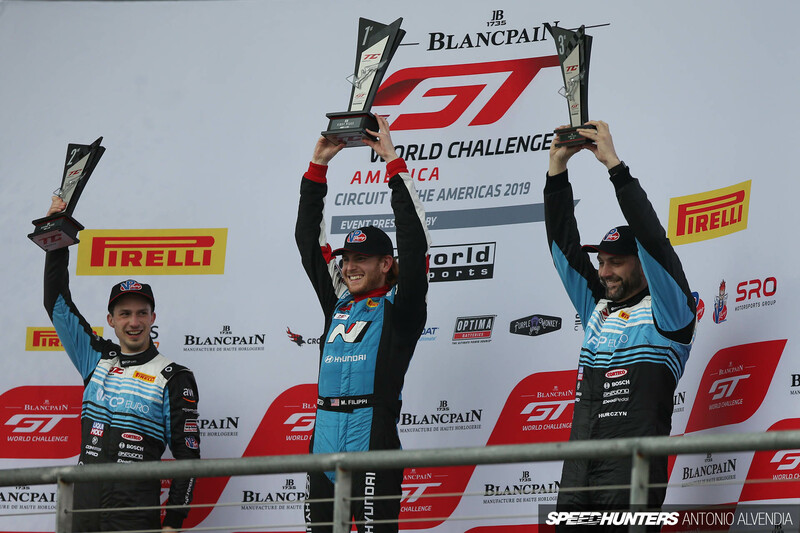 Their consistent pace led Martin and Caesar to stand atop the podium, winning top honors in the GT class for the first race of the weekend. 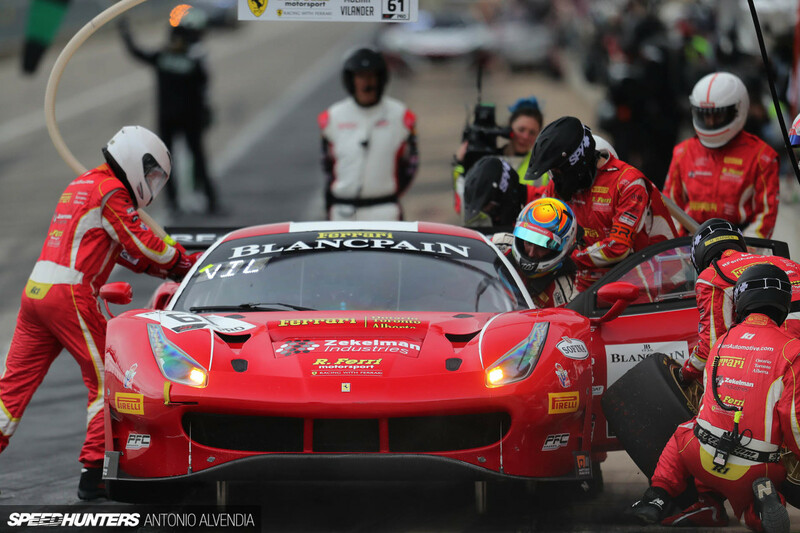 Drivers do not win races alone – they can’t do it without support from their team. Martin and Caesar have TR3 Racing handling all the logistics and mechanical work on the Ferrari so they can just focus on going fast. Another car that certainly caught my eye in the Blancpain GT World Challenge’s line-up of amazing GT3 cars was this Acura NSX GT3 Evo. Would you just look at those massive Brembo brake rotors filling the entire inside of the OZ Racing center-lock wheel… I can also appreciate how the Pirelli Tire logo was delicately sliced up to fit the air relief scallops on top of the front fender. It looks like a lot of painstaking work, but the crew member who applied the logos did a great job and I appreciate the attention to detail. It’s really cool to see Japanese supercars running in the series. 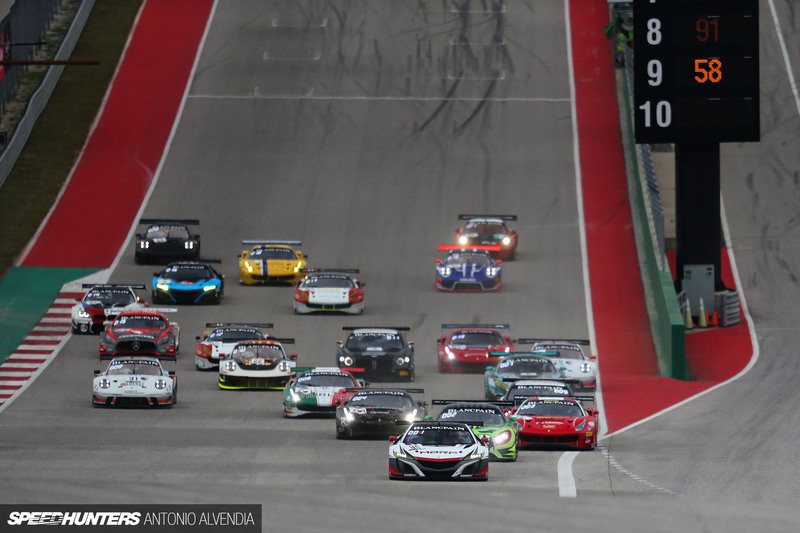 It makes me think about just how international the Blancpain GT World Challenge is, with drivers, teams, car manufacturers, and media outlets participating from all over the world. 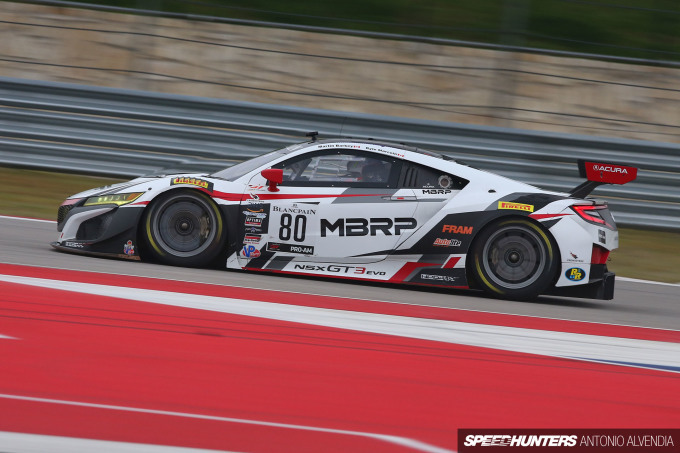 This particular NSX GT3 Evo is being campaigned by Racer’s Edge Motorsports, with Canadians Martin Barkey and Kyle Marcelli sharing the driver’s seat. Er, not at the same time… That would obviously be a very tight fit. 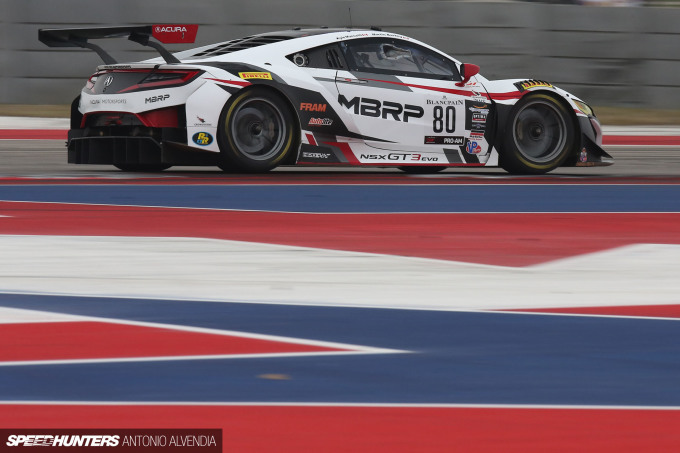 Barkey and Marcelli only took delivery of this NSX GT3 about one month before the race, but still achieved pole position and First Place in the GT3 Pro Am category. That’s impressive. 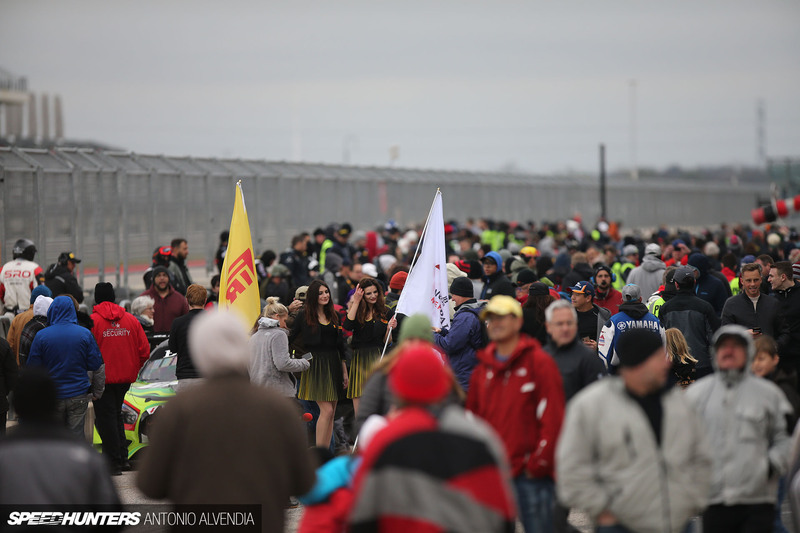 Despite the freezing cold weather (34°F/1°C at times) over the weekend, the paddock area at COTA was busy all weekend, with race cars moving around from their garages to the SRO America scales for scrutineering and downloads of the race computer data and onboard camera footage after each session. 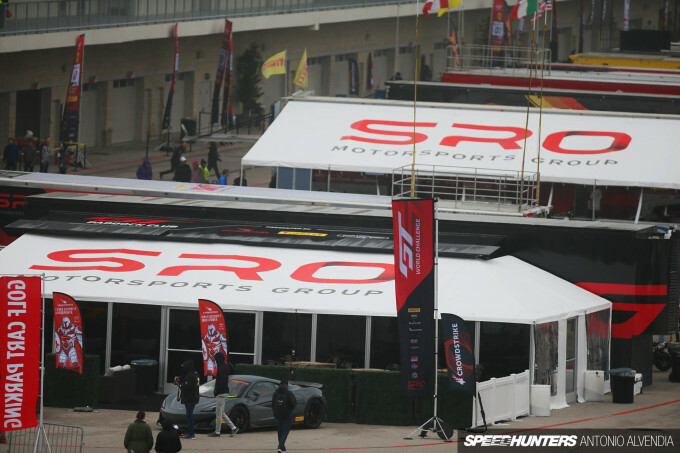 In front of the technical inspection area, SRO America set up a hospitality area called the GT Paddock Club, where drivers and guests could hang out together, get food and drinks, and even sign up for on-track driving experiences using a fleet of McLarens or Audi R8s. I’ll definitely need to sign up for one of these test drives in the future. 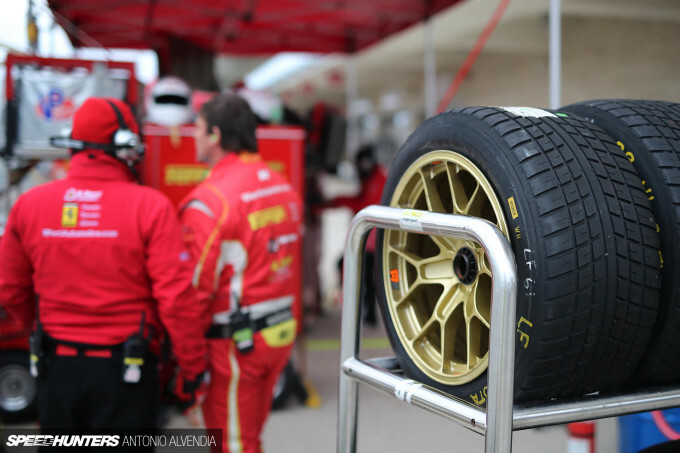 Aside from pit lane and trackside, I always love shooting photos in the garages of the race track. There’s always an interesting scene to be found, and you can get up close and personal to the cars while they aren’t out lapping. 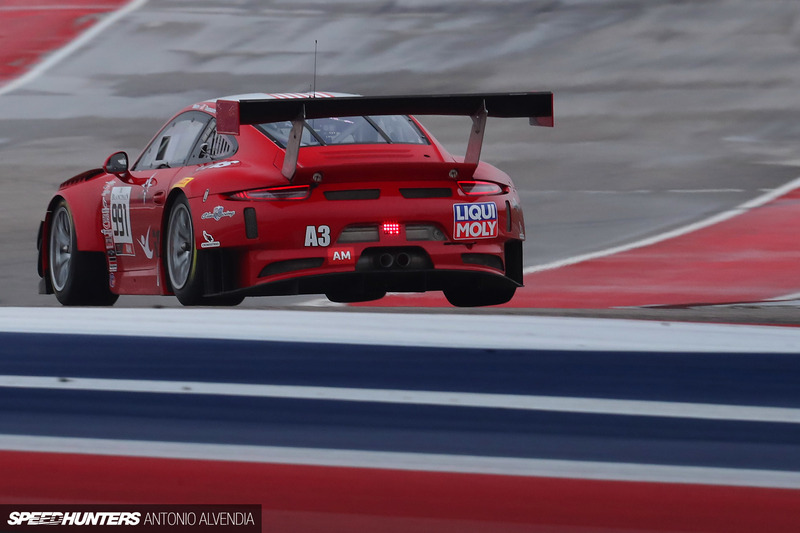 I just love the look and sound of the 991 Porsche GT3R. Interestingly enough, it says ‘I FLY’ on the hood of this one, being driven by Joe Toussaint and Alan Metni from Autometrics Motorsports in South Carolina. Maybe the logo gave a hint of foreshadowing, because I spotted the car flying over rumble strips. I was so happy to see the guys catching some two-wheel action on track. 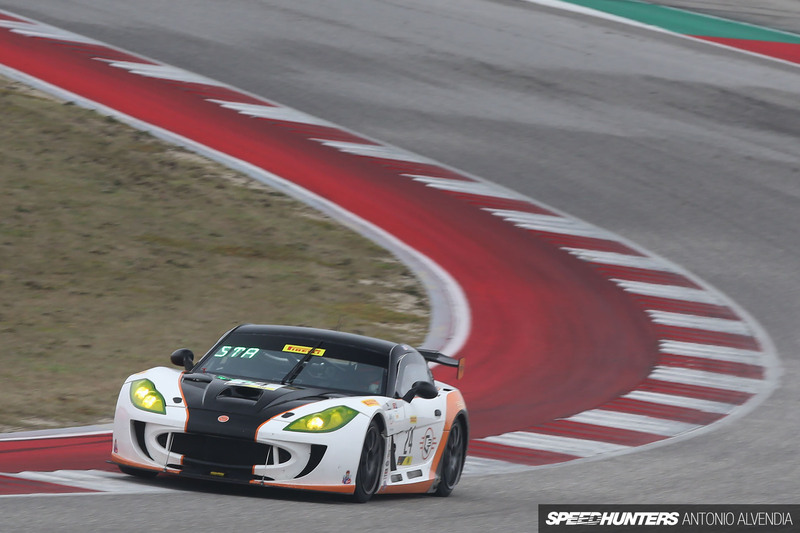 While the big GT3 cars are certainly amazing to look at, the GT4 America class is definitely one of the most fun to watch. 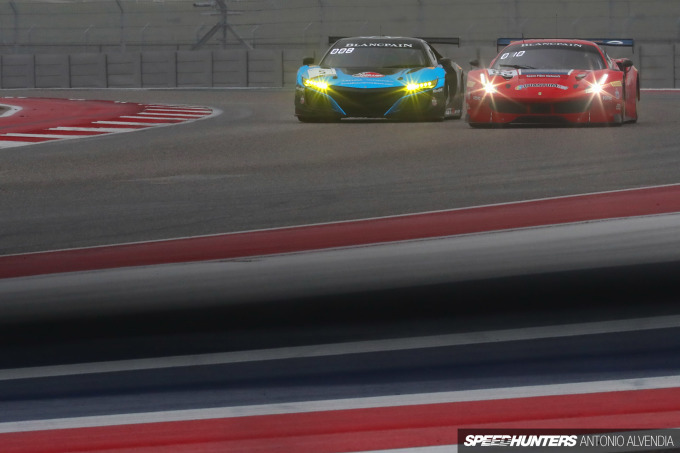 At race start, there are between 30-45 McLaren 570S GT4s, BMW M4 GT4s, Audi R8 LMS GT4s, Mercedes-AMG GT4s, Ford Mustang GT4s, and Porsche Cayman GT4s on the track, battling it out fender to fender at the same time. 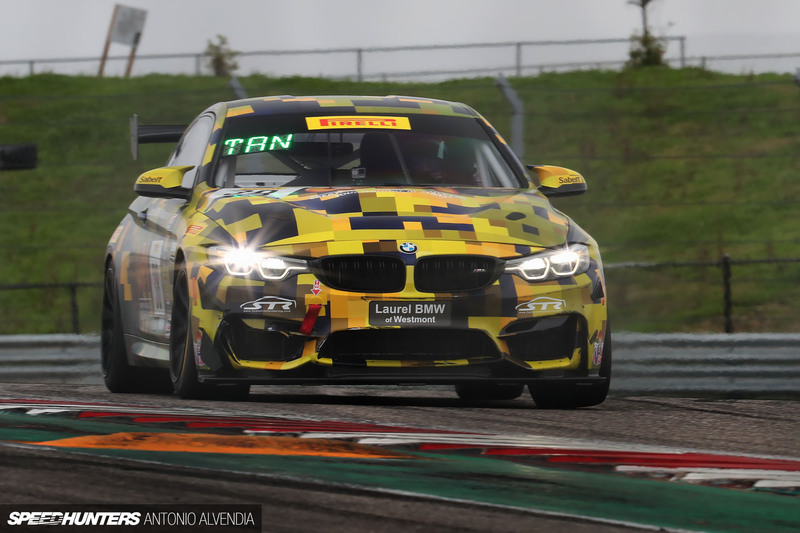 This BMW M4 GT4 clad in navy blue and yellow digital camouflage is being piloted by Canadian driver Samantha Tan, who originally hails from Toronto, Ontario but is currently going to college in Southern California. It’s so cool to see drivers from different age groups, geographical locations, and ethnic backgrounds in the series. 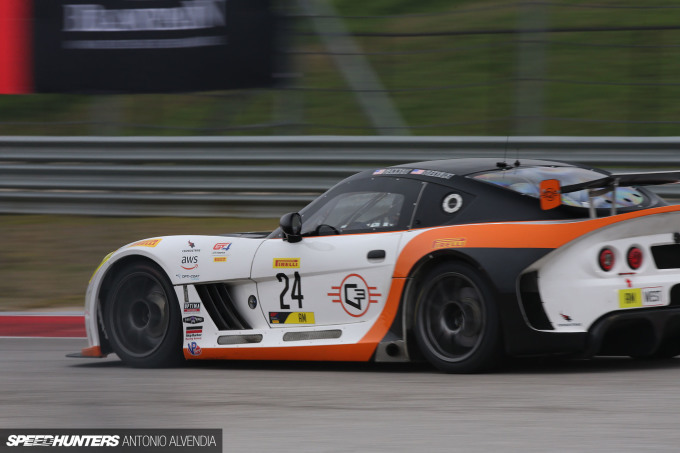 The GT4 America series also includes other interesting cars. Driven by Drew Staveley and Frank Gannett of Ian Lacy Racing, this Ginetta G55 GT4 is powered by a 3.7-liter V6 Ford engine that puts down 380 horsepower. 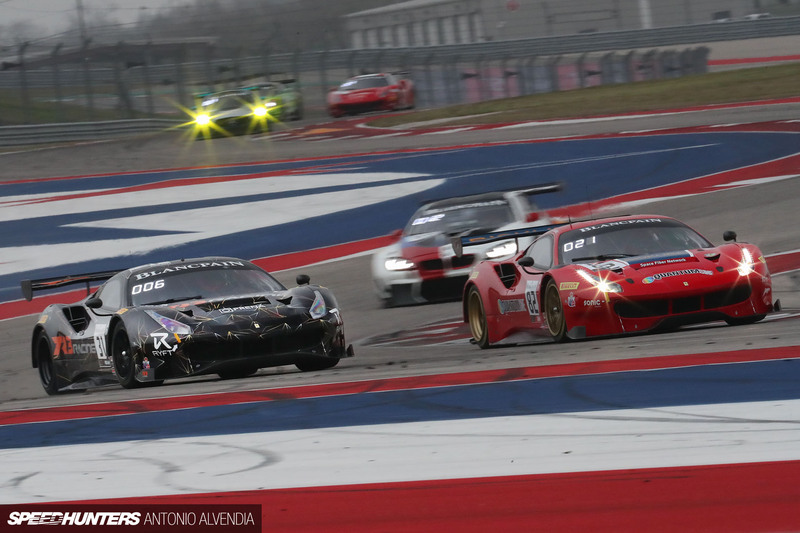 The duo ended up finishing in second place at COTA. It makes sense that Drew is driving a car with a Ford engine, because he is actually an instructor at the Ford Performance Racing School in Salt Lake City, Utah. He’ll be switching cars to a Ford Mustang GT4 this coming year, so it will be exciting to see what types of results he’ll be able to get in the seat of a new race car. The third series in the event is called TC America, a touring car championship that includes both normal-bodied touring cars and the super cool global homologated TCR competition cars, which have wide-body aero that looks similar to what DTM race cars use. 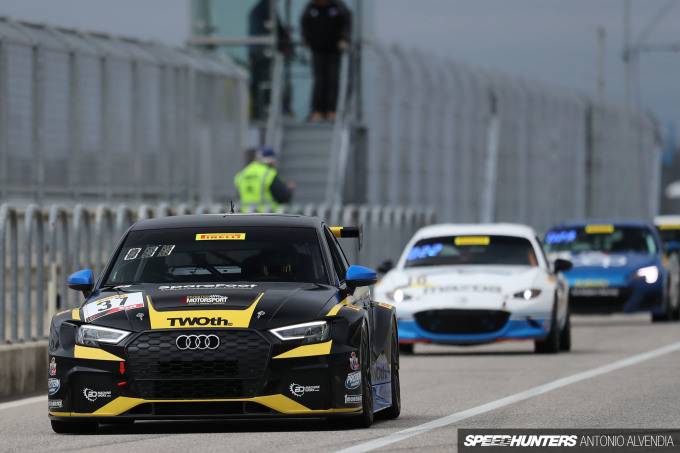 I love the aggressive look of the Audi RS3 LMS especially, The black RS3 LM3 pictured was driven by Canadian driver Eddie Killeen. 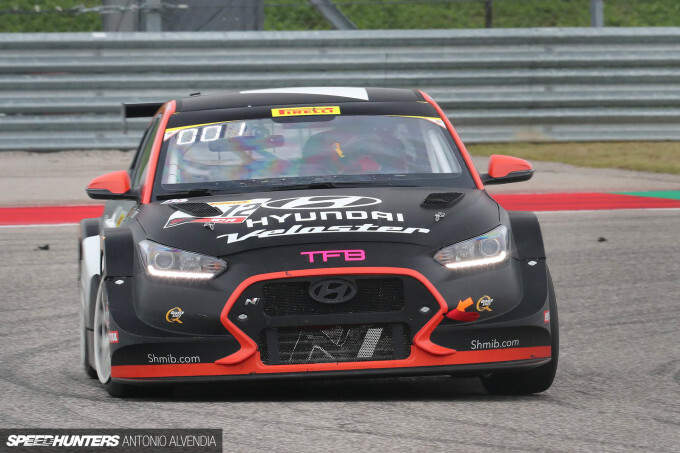 One of the fastest TCR drivers on track was Californian Mason Filippi, who finished both races in first place behind the wheel of this TCR-spec Veloster N, earning a pretty sizable contingency check from Hyundai. For those who haven’t driven a Veloster lately, you really must check out the Veloster N. I recently test drove one, and was shocked by how hard it accelerates and how well it handles. I especially love the turbo gurgle and popping sounds it makes when you decelerate. Super fun. 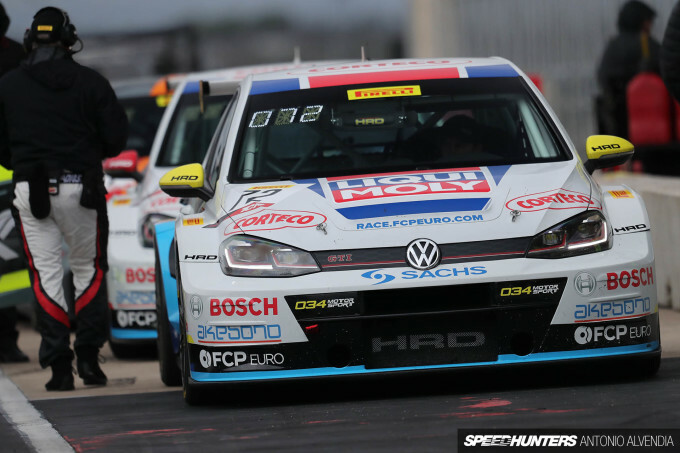 While Filippi won first place over the course of the weekend, the driver that impressed me most out of all the classes was Nate Vincent from Connecticut, driving the FCP Euro Volkswagen GTI TCR. Nate put down great lap times in qualifying and was looking good for P1. 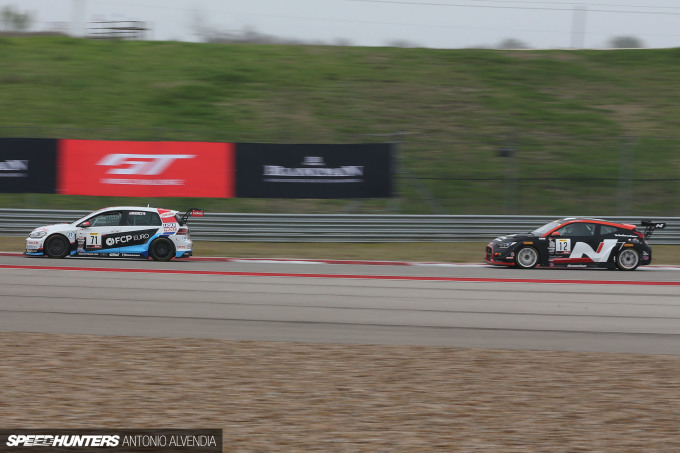 However, his TCR Volkswagen encountered some technical issues – in one of the practice sessions, four of the bolts on the car’s new sequential gearbox vibrated loose and sheared the engine mounts. 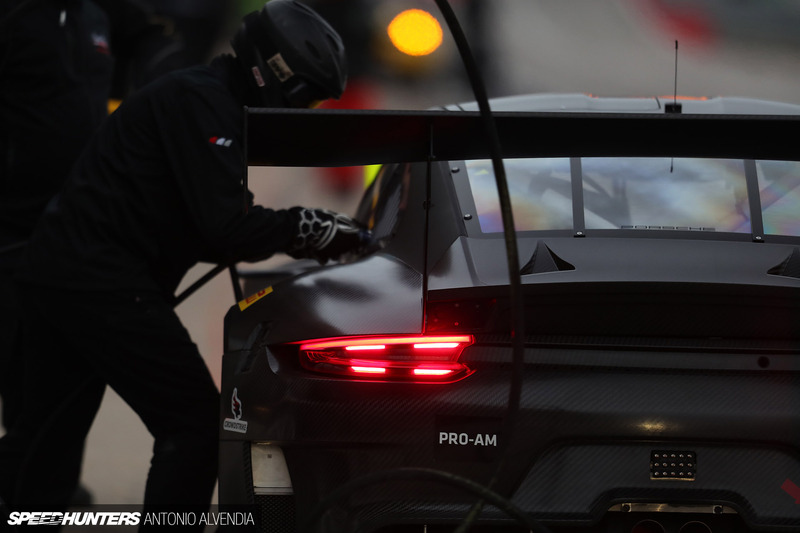 The FCP Euro team furiously rushed to fix the problem – in fact, they had the car up on its air jacks and were still working on it while Nate was on the starting grid, strapped in with his helmet on. The team of mechanics did their best to fix the problem, but ran out of time. 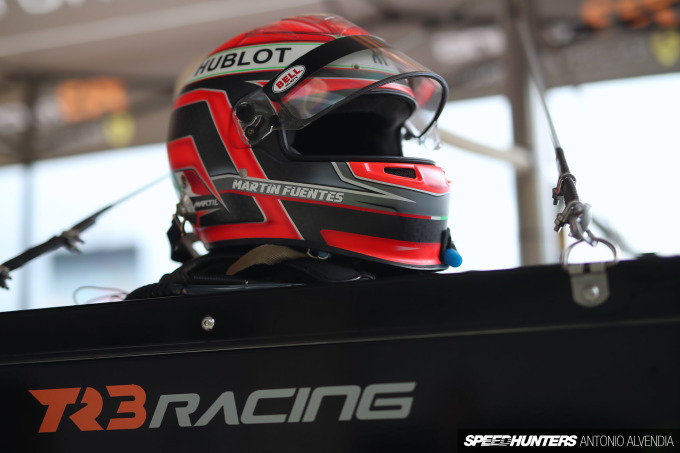 Then, when Nate was on his warm-up lap, his MoTeC dash display went totally blank. 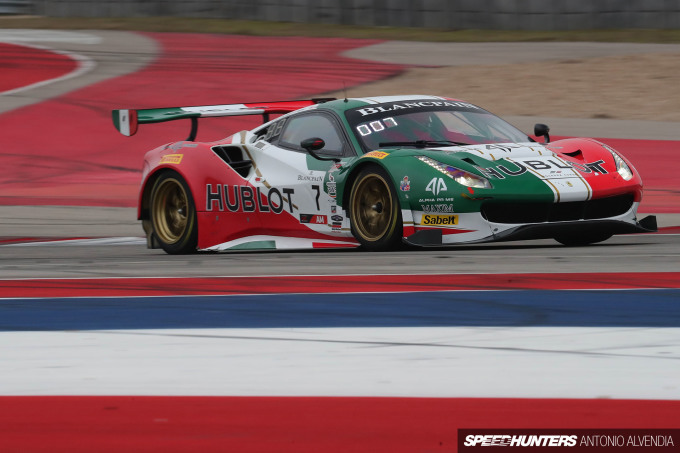 He explained after the race, “I didn’t have any data from the car at race start, so the crew advised me over the radio to cycle the ignition when I got to COTA’s back straight.” Nate basically had to build up momentum, turn the car all the way off and then turn it all back on while he was at speed. He managed to get all of this done, but after the car restarted, it was stuck in some sort of limp mode and didn’t have any power. As a result, all of the cars on the field passed him. The mechanics advised Nate to drive back into the pits, but as he made his way towards the pit entrance, he kept cycling the ignition. Suddenly, by magic, prayers or pure luck, the car miraculously came back to full power – only two corners before the pit entrance. Nate decided not to pit, and went into full attack mode. He built up momentum on the straight, and prepared to make his move. 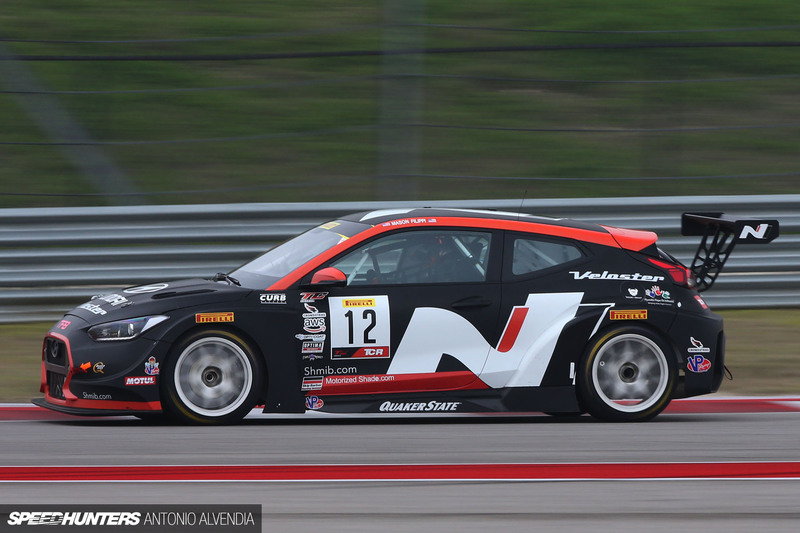 As all the rest of the cars dove into the inside line, Nate kept accelerating and hit the brakes as late as he could, taking the outside line to avoid all the traffic on the inside corner. This move allowed him to pass about 10 cars in the first corner even though they were driving two to three cars wide. 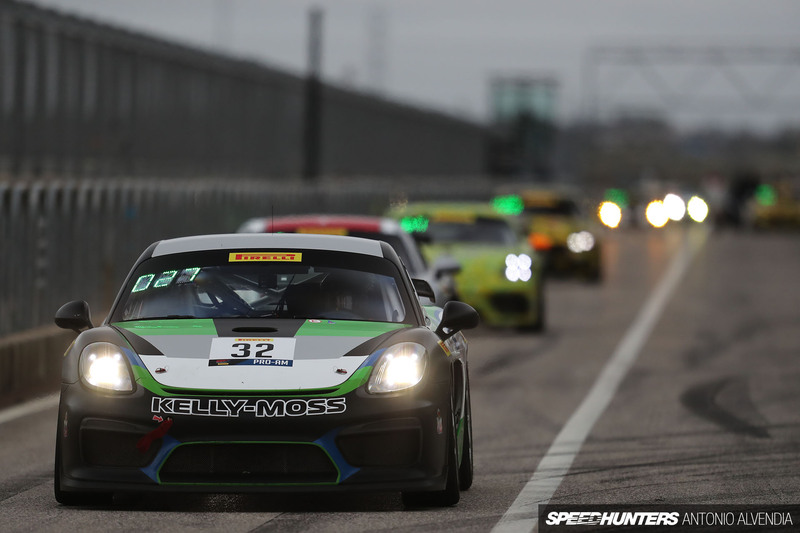 Nate continued his attack on the esses, and gradually made his way to the front row again, passing 30 cars in two laps. 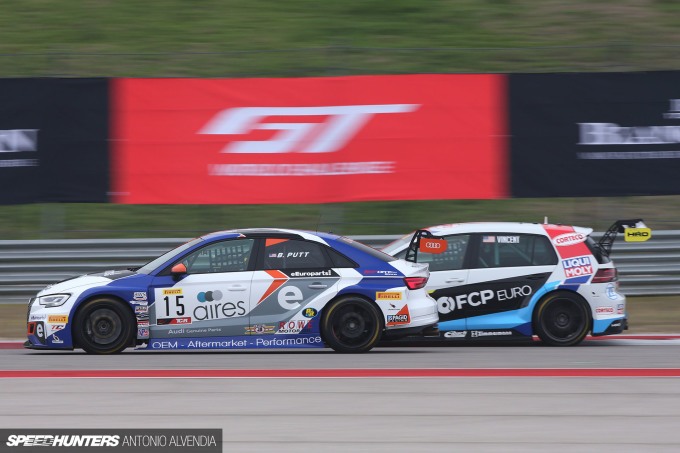 Amazingly, Nate finished Race 1 in third place, right behind his FCP Euro teammate Michael Hurczyn. The next day, he finished Race 2 in second place (as pictured above). I wanted to share this story because I love situations when people overcome adverse conditions to fight their way to the top. It was, by far, one of the most exciting aspects of the event weekend for me. 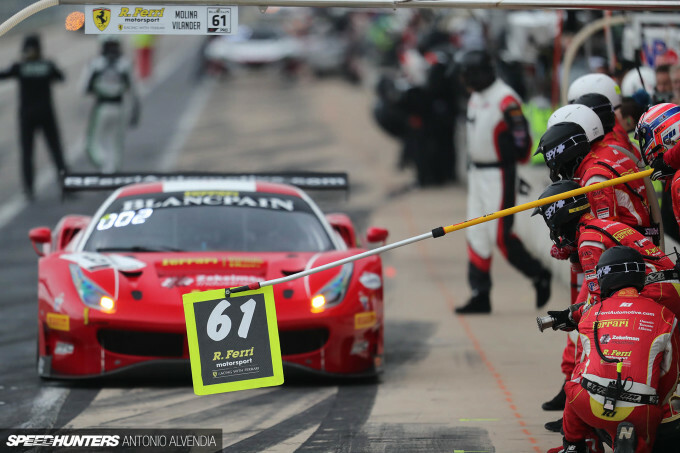 Aside from the amazing cars and the racing itself, the thing that makes these Blancpain GT World Challenge events so exciting to me is seeing all of the professional GT3 teams out on pit lane as their race cars come in for refueling and tires. 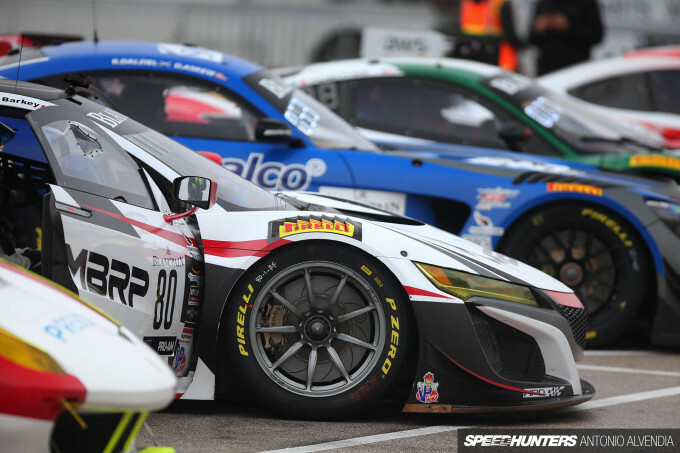 This is the R. Ferri Motorsport team from Toronto, poised and ready for their Finnish pro driver, Toni Vilander, to come into the pits to change seats with teammate Miguel Molina. It’s so interesting to watch the team mechanics during a race. 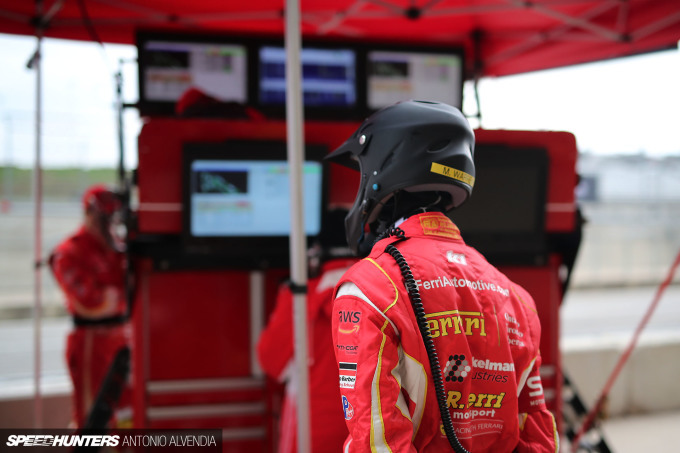 These guys stay at the ready, watching the car’s vitals on their trackside screens and communicating with the driver via the radio system. 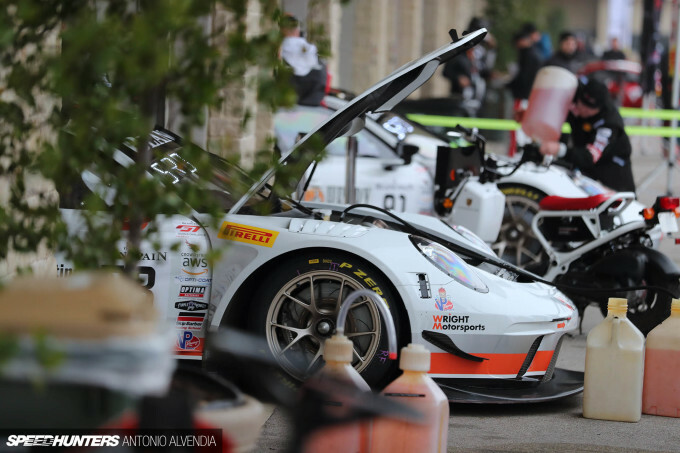 The more I watch sprint and endurance racing, the more I realize how crucial it is to have an experienced pit crew. This particular team also looks awesome, with all uniforms and service vehicles color coordinated to match the car colors. Amazing. While there are certainly a lot of photos and videos of these cars circulating online, I really encourage everyone to make it out to an event if possible. There’s just something about being present at the track. 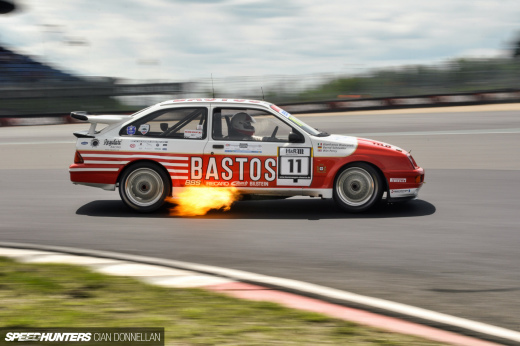 Hearing the cars scream past you with glorious exhaust notes at wide open throttle definitely gets your heart pumping, and listening to all the detailed sounds of racing – the tires at their limit, the transmissions shifting, and the squeal of the brakes deep into each corner – it’s a feeling of excitement that just can’t be expressed via photos and videos. 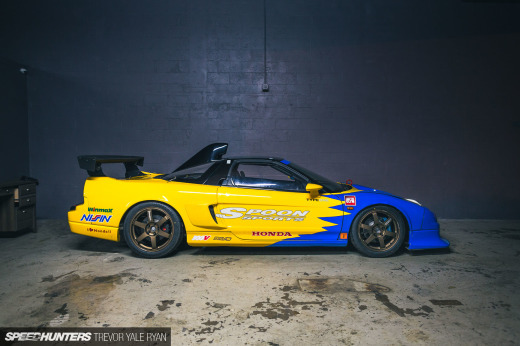 I hope to meet Speedhunters readers at a race in the future. 6:05 pmMarch 18, 2019 Basith P.
I love these race events! me three! 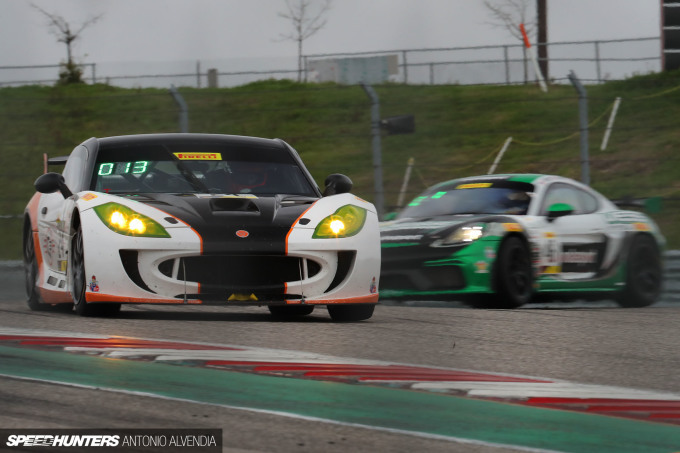 the next race of this type I plan to shoot is the California 8 Hour Endurance Race at Laguna Seca on March 28-30. I wish I could make it to Bathurst one day! I haven't been to Australia or New Zealand yet, and I want to absorb the car culture there firsthand! So many Ferrari's!! hehe I always vote for the Bentley's because I love how they took a super heavy bloated luxobarge and made it into a massive contender. Yeah, these things are light - under 1,300 kg . Being allowed to ditch the AWD system shaved a bunch of weight, and most of the exterior is carbon fiber. Totally beautiful machines. Definitely Justin! And they sound even better than they look! Super distinctive on the track! holyyyyyyyyyyyyyy now this is pretty awesomeeeeeeeeeee !!!!! Wow awesome pics and coverage Antonio. I feel like the photos belong on a nice coffee table book or something. Cool to see lots of my Canadian peeps there too. I can't wait to someday go to Canadia and shoot photos of that red turbo AE86 at Drift Jam eh!!! I've only seen 800mm lenses on the internet, not in real life! I think they cost a million dollars or something! haha! For these photos, I used a 400, 300, 70-200, and 50mm prime! I watched a lot of that weekend on YouTube and I have to say those Bentley cars are wickedly fast for as big as they are. I also enjoyed that Risi has a TC Alfa Romeo that was also wickedly fast, unfortunately it met the wall at the St Petersburg race. Technically you're absolutely right JJ, but the series is a bit different now that it has ownership by the French SRO team. In my opinion, it's a lot more exciting now! Also given that the world challenge didnt really have pit stops (or driver changes) until the last season i believe, I would definitely say that this is the debut of a new series using the branding from the last generation of the series. Think of it this way, there will be a debut for the next generation of any car on the road. It still may be called the same thing as the last generation but it is still a debut. Would love to see SH cover more racing. 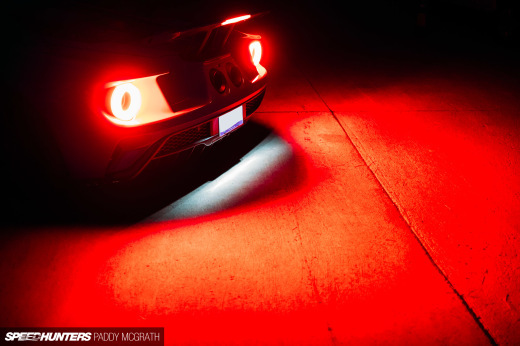 Articles like this with detailed background knowledge about drivers and the cars really make it hard to put down the phone without reading all the way through. Great story and photos ! 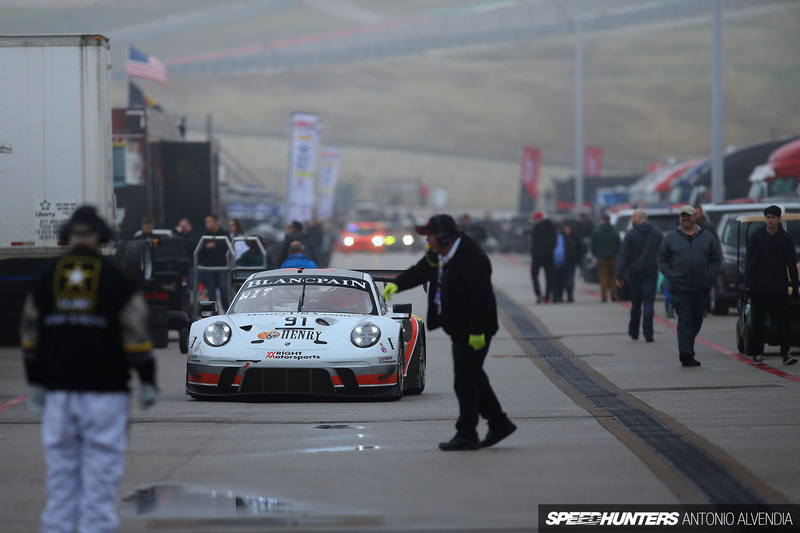 GT3 cars really are a treat to watch! Loving the Big Bentley's!! 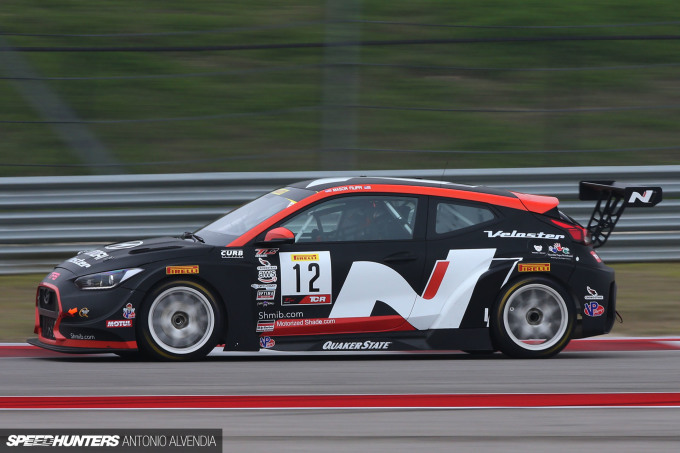 I just wish Nismo would be more consistent when entering its factory GTR GT3 into this series. Mannnnn those big Bentley's sound amazing Neill! I really should try to record sound on those things next time! Thank you Karlo! That's awesome! Are you bringing the GTR to Laguna??? Or a different car? yo! I'll be with my family, so Im bringing my Swagger Wagon (Toyota Sienna) lol! haha nice! Swagger Wagons are dope! Better than a limo IMO!